This year sees the 200th anniversary of Clara Schumann's birth. 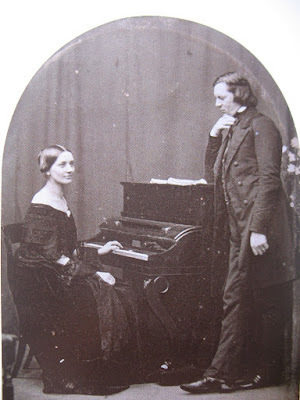 Still best known as the wife of composer Robert Schumann, she was also a major musical figure in her own right, one of the 19th century's most influential pianists and a composer of some stature. A festival at St John's Smith Square from 22 to 24 February 2019 is planning to reveal more about Clara Schumann the composer as well as shedding light on other aspects of her life. There will be a rare opportunity to hear all of Clara Schumann's published songs, 29 in all, performed by soprano Sophie Karthäuser, tenor Alessandro Fisher and pianist Eugene Asti. Pianist Gamal Khamis will be performing Clara's piano works alongside those of Bach, a composer revered and studied by both Robert and Clara, whilst pianist Mishka Rushdie Momen will be performing the Handel Variations by Clara's friend Brahms (the work is dedicated to her). Robert's wedding gift to Clara was the song cycle Myrthen, and there will be a chance to hear songs from that cycle alongside the songs from the cycle which Robert and Clara wrote jointly, Clara's Variations on a theme by Robert Op. 20 and Robert's Fantasy in C Op. 17 performed by soprano Marie Lawson, baritone James Newby, with Eugene Asti, Mishka Momen Rushdie and Gamal Khamis. The Busch Trio (Mathieu van Bellem, Ori Epstein, Omri Epstein) will be performing Clara's masterpiece, the Piano Trio in G minor. Other relationships explored include the friendship with Mendelssohn, and Clara's long friendship and musical partnership with the violinist Joachim. The festival ends with Brahms' Vier ernste Gesänge Op. 121 performed by Stephan Loges (baritone) and Eugene Asti, songs which Brahms wrote as a testament to his long friendship with Clara.